Catholic Fried Rice: "I Love You, Man"
Probably the biggest thing I missed during my Costa Rica year was the ability to call any of my brothers (close guy friends, if you will) and hang out. Don't get me wrong, I got to hang out with great guys in my housemates Jordan Differeding and Tom Robertson who are the different friends I needed to talk and play basketball, goof around in Spanish, and explore a whole culture and country together. I would say I had acquired two new brothers this year, along with Tim Smilnak and especially Mike Lamanna, my designated prayer partner, in the FC Syracuse house. As Tom would say, I picked these four guys up in this past year's draft. But this past year, I had definitely missed the guys who were already on my core team. But in the past several weeks back in the states, I have gotten to catch up and more to the guys that matter. First week in D.C., it was project man time. Boom, dinner with Bobby Kilner (the boy's going to the seminary today!). Boom, movie and dinner at Mike Iskandar's house. Boom, happy hour with Chris Paris. My bros and my love....kind of sums me up in a nutshell. I trained down to North Carolina to see what's up, and unfortunately my pickings were slimmer. I had lost Chris Love to team Atlanta where he works now, and I couldn't reach Sam Pendergraft at all, so he must be on the 15-day DL somewhere. In last summer's draft I had picked up one of my boy's Andrew Lipetsky and we got to catch up like we know how: Frisbee golf, talks about married life (the guy just got hitched), and burritos at Moe's. I came back up to a Silver Spring trip that was epic. I walked into the guy's apartment, and there we were, Paris, Anthony Rennekamp, and Zack Malone (the Spring Break and summer NC travel squad) along with Dan Burns and Matt Tixier, all sitting hanging out talking about the Transformers like we were all in my college suite again. That night, Bobby subbed in for Zack and it was an epic seven-man feast of eat chicken with your hands at Naando's (a new favorite, great $6.95 deal). 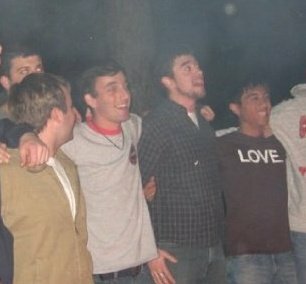 As Chris put it, there was no better atmosphere, at that price, with the quality and quantity of guys to spend it with. I think even our waitress (who we dubbed "Chicks rule", after her clever work shirt) could tell something special was happening that night. The following nights my best friend Anthony and I hung out and stayed up late in Matt and Anthony pillow talk style like we always do. He's picked up guitar, so that first night we didn't say a word to each other but just jammed out, even writing a new song. He is my official musical muse who I was definitely missing in the CR. The next night we hung out outside with stogies (again, classic us), talking about vocations (not surprised here), girls (appropriately part of the vocations discussion), and the beauty of brotherhood. We agreed, blessed to have one of my best bros back, that's for sure. Then boom, this week CUA happy hour and I catch Casey O'Conor and Mark Koury, another two guys I held close and were part of great times in my life (House and Esto Vir, respectively). Then, last night at Koury's b-day, Kilner and back to full circle with Joshua Baum which ended in classic Matt and Josh style Wendy's chow down in his car. I woke up this morning...feeling completed. My brothers...complete me. Actually, after talking to Josh, one guy missing in this mix and is like that missing puzzle piece is my freshman roommate Matt Patella. That guy's out in Long Island and soon in Boston, I don't know if I'll ever get to see him anytime soon. Patella, if you're reading this, I miss you man. Let's save water sometime. Others missed as well: Chris Ladner and Ryan Gebhart. These officers were part of our 8-pack of Snowmagedon week and a huge piece of my Senior Esto year. Hope to find you guys in the near future. Before I end this, I have to throw in some honorable mentions in the mix. First three, Joe Moser, Andrew Finley, and John Simpson. I'm always humbled when anyone buys me a beer, and the act is not soon forgotten in my book. I owe these three a beer one day whenever I get the chance. I should throw in the mix too Jonathan Jerome, Nick Valentino, Craig Mariconti, Kyle Bakas, Robert Poppleton, and all those other guys I hung out with at the wedding. Lastly, it kind of goes without said that my real brother, Mark Aujero, tops all these guys as he is family. Getting to hang with him and my brother-in-law Steve around has been the best a little brother could have. "I love you, man." That movie is about a man who doesn't have any guy friends so he goes on a search to find friends to be his groomsmen. "I love you, man" is also a phrase I frequently use with my guy friends, my brothers. Guys who, at the end of the day, complete me and make me a better man. In the end, I think I'll be the one who has a hard time figuring out my groomsmen too...the hardest part trying to pick the few to stand up there with me. Thank you God, for my boys, my brothers.